I never expected to be playing Max: The Curse of Brotherhood on a PlayStation 4, as the game was originally published by Microsoft, and developed by their first-party studio Press Play. One studio closure later (alongside the founding of a new developer called Flashbulb Games), and the 2013 puzzle-platfomer is now available on Sony’s console four years after debuting on Xbox One. It’s been a strange journey, but it’s one that PlayStation gamers should be grateful for. The Curse of Brotherhood is the sequel to 2010’s Max & the Magic Marker, and it winds up using the same core mechanics. Players control a boy named Max, who is a pretty ordinary child except for the fact that he has a magic marker that allows him to interact with the environment. 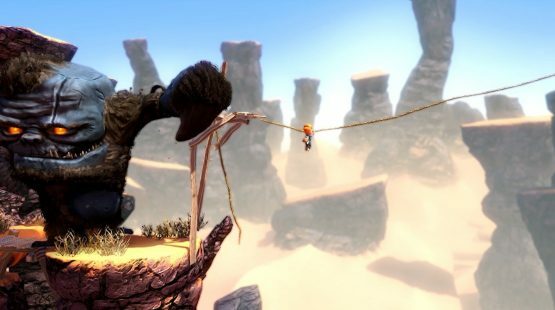 New skills are learned throughout the six-hour adventure, but players are mostly drawing vines and raising rock structures to maneuver their way through various puzzles. There’s no motion control like the original game (which debuted on WiiWare), which means that players have to press the right trigger to activate a drawing mode. Once activated, players can move their marker around the screen and interact with the highlighted areas. The interactivity is limited, as it’s not like Kirby: Canvas Curse that allows players to draw freely, but it works in its favor as the puzzles are intelligently designed to force the player to use all of their different skills. For example, one of the early moments that really felt brilliant was when I learned that I could attach vines to other objects such as rocks and branches. I had previously only used vines as ladders and swings, so making it able to potentially move objects was a real game changer. All of the later puzzles in Curse of Brotherhood all revolve around subverting what the player is used to, and having to use familiar tools in unfamiliar ways. There were so many moments while playing that I encountered a puzzle, and had no clue what to do. I’d recognize the three or four interactive points, yet I’d be at a lost as to how I’d use them to continue my progress. It’s getting to overcome these moments where the game really shines, as with enough ingenuity, these terrifying puzzles become easily passed. While I really enjoyed most of the puzzles, there are certain ones that force players to create new objects with specific timing. For example, a monster might be chasing the player, and it’s up to Max to quickly draw a vine in order to use it to escape. The control scheme works fine during non-action sequences, but having to hold the right trigger and then use the analog stick to find the interactive area sometimes took too long. The controls simply aren’t suited towards fast action, and it made some moments more frustrating than they should’ve been (mainly because some puzzles take several steps to setup, and I’d have to redo them due to failure). The Curse of Brotherhood was a real visual treat when it launched on Xbox One in 2013, and while it’s not quite as impressive in 2017, the art style has held up very well. There are some really gorgeous moments throughout, which is largely due to the vast array of different locations the player goes through. 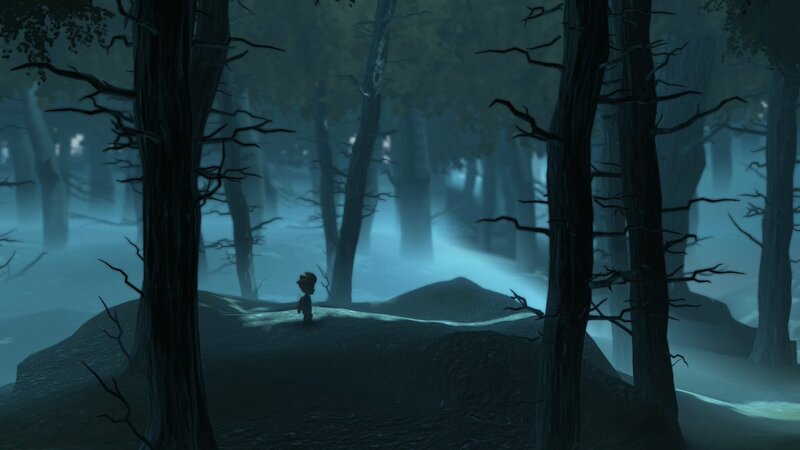 A lot of the locales deal with spectacle, as players will see vast canyons, and large waterfalls, but there’s also some lovely moments on a smaller scale such as a quick tribute to Limbo. Occasionally the spectacle will get in the way of the gameplay, though. This is due to some Uncharted-like action sequences that have players running away from giant monsters or attempting to do some daredevil stunts to survive. If pulled off on your first go, these moments are amazing (especially the suspenseful moments that slow down time in order to allow the player to use their marker). Sadly, one mess up and the magic of the sequence is quickly broken. Part of this comes down to my play, but the moments fell flat more often than not (and this wasn’t even my first playthrough of the game as I originally played it on Xbox One several years ago). Some strong art direction and great puzzle design helps Max: The Curse of Brotherhood manage to be worth the time of PlayStation 4 owners. It may have launched four years ago elsewhere, but there’s plenty of unique elements that help separate it from the rest of the crowd. There are some really great ideas waiting to be further iterated upon, so hopefully this isn’t the last we’ll see of Max. Max: The Curse of Brotherhood PS4 review code provided by publisher. Version 1.00 reviewed on PlayStation 4 Pro. For more information on scoring, please read our Review Policy here.